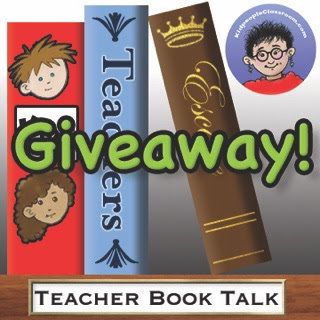 Happy Teacher Book Talk Tuesday! 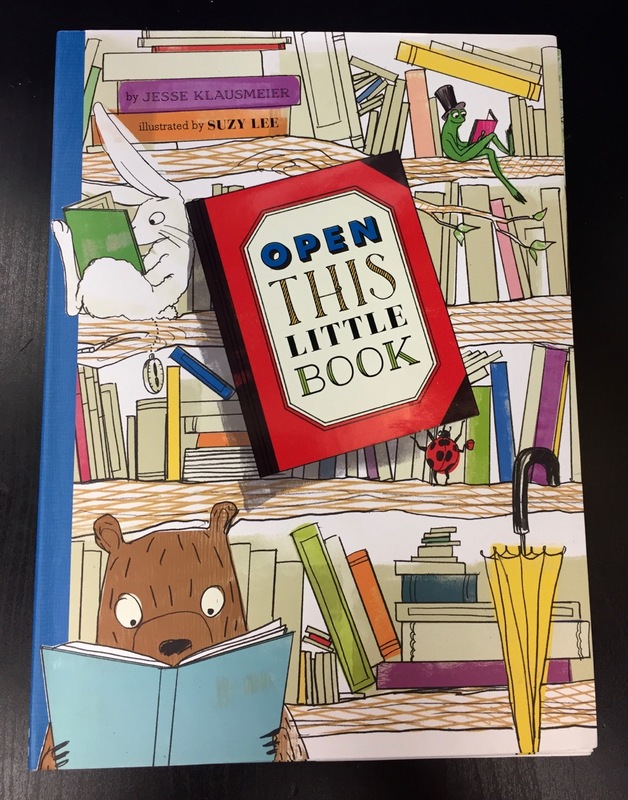 Today I'm sharing three books which launch good makerspace projects. 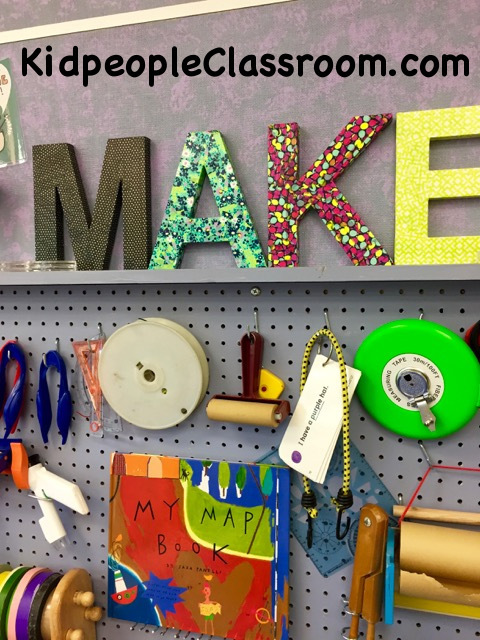 Simply put, a makerspace is a place where people gather to design and create things, sharing ideas and equipment. Makerspaces are closely tied to STEM and STEAM learning and they can be found in more and more classrooms in all grades. 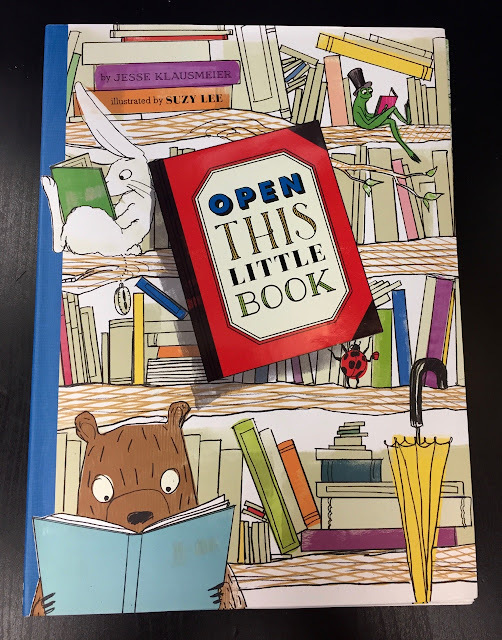 As this post is about books to use with kindergarten makerspace projects, I'll not go into makerspace discussion right now. 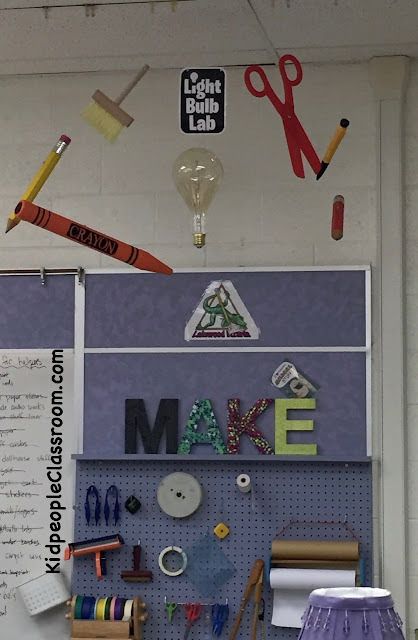 I plan on posting all about what I have set up in my classroom makerspace at a later date. I share just a couple snapshots, so you know where projects happen in our room. We call our makerspace The Lightbulb Lab, as in Kevin Henkes' Lilly and the Purple Plastic Purse... I aim to bring literature to everything we do. We don't have power tools and 3D printers to use, like older kids often have in their makerspace, but we have a plethora of supplies for what I call paper engineering– paper of all sorts, writing tools of all sorts, and tape... oodles and oodles of tape. We have a lot of miscellaneous things too, like popsicle sticks, chenille stems, paper punches, crimpers... you get the idea. The kids don't need a lot of prompting to get started. Some kids get really comfortable doing a particular "thing" and get a little stuck wanting to do that exclusively, so I introduce new concepts throughout the year. 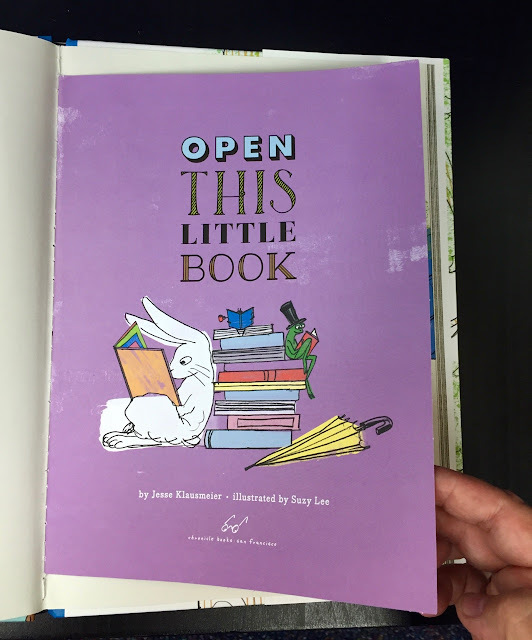 I often use books to teach into a new idea, asking the kids to expand on what they see. Here are three books, which I use to prompt new creations... sort of bends in the road with our yearlong makerspace learning. Do you know this book? It certainly is not new, but it is a great leaping off point. Maps are part of our math and social studies curriculums. We look at a map of our classroom, using it to find objects I've hidden ahead of time. 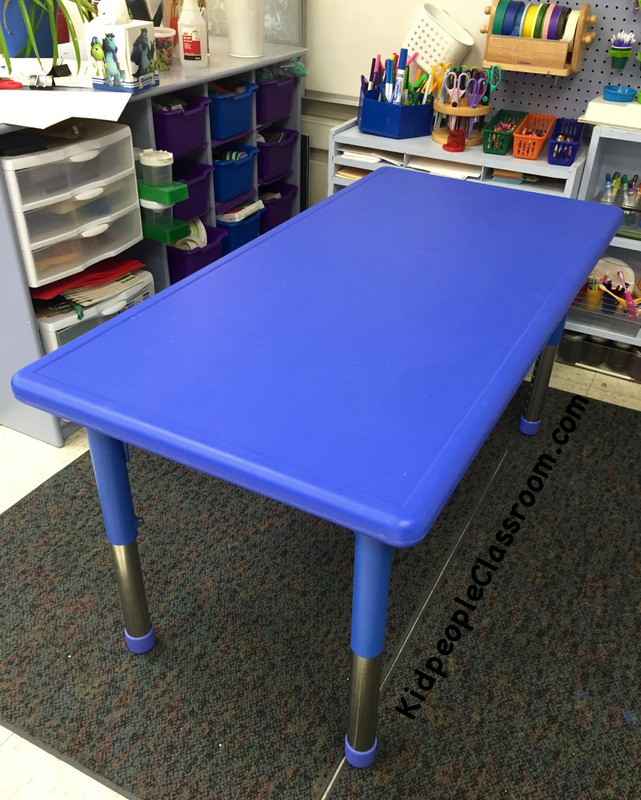 I put very basic maps of our classroom with only key pieces of furniture on it out in the Lightbulb Lab to get the kids started with making their own maps We use a map of our school, too, and look at real maps of our city, state, country and world. Then I introduce the book. 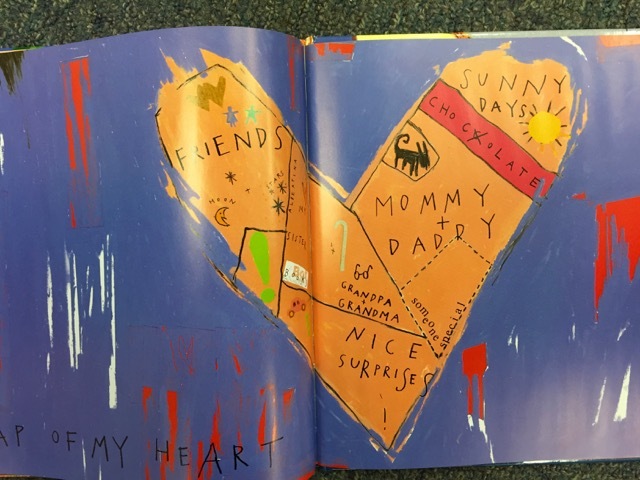 This is a treasure map from the book. 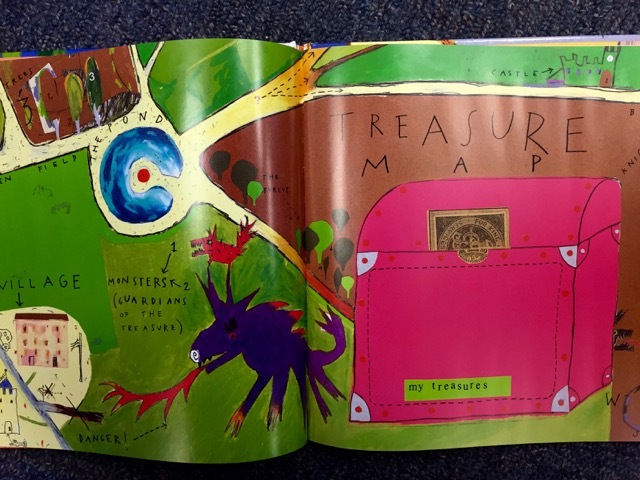 By the time we see it we have seen other treasure maps, and know this one is not typical. This map of my heart expands the idea of maps further yet again. We talk about how a real heart pumps blood and does not look like this. When people speak of what is "in my heart" they are talking about things which they love. I point out small details on this map, like the cane and eyeglasses for grandpa and grandma. This naturally leads to the idea of "symbols" to represent real objects and people. I draw a bone for Popeye, a lego hat for Jonathan, and a jet plane for my eldest daughter who can really only be reached in Seattle by plane, and who works at Boeing. By this time in the year the kids have seen me draw Popeye and Jonathan many times in writers' workshop. I always illustrate them as they "really look" so using symbols instead, piques the children's interest. As kids experiment with symbols they sometimes come up with hilarious things– moms represented by slippers and baby brothers by poop... the explanation was that said brother often had poopy diapers, but I think there may be another layer of meaning when little brothers are drawn as piles of poo... just sayin. 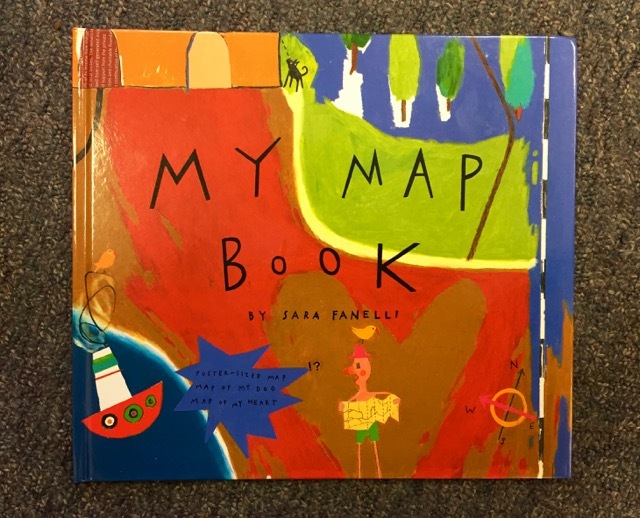 There are lots of other fun maps in this book, too, including a map of a dog, a map of my family, and a map of my day... which is cool as it represents a daily schedule in a new way. I read just one or two maps each day, so it can take over a week to finish the book. Each day kids get new inspiration. We talk about techniques kids could use to make similar maps, and what other things in life could be shown as a map. We discuss 2D and 3D maps, and they learn how to make "pop-up" objects for their maps. My Map Book hangs out in the Lightbulb Lab for many weeks and becomes great reference that they use again and again. I highly recommend you actually add this book to your classroom, and not just borrow it from the library this time. You can get used copies for really cheap and it is worth the investment. 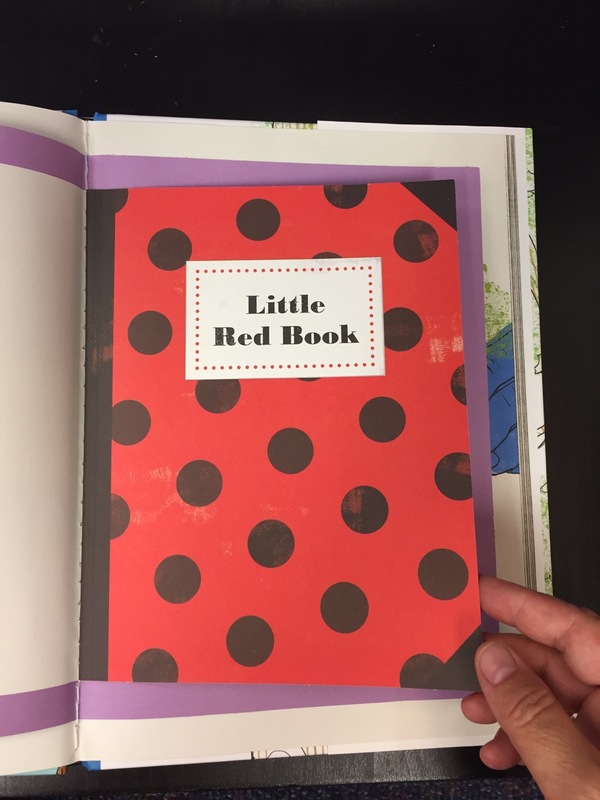 This is a special book because it is one story, but with many books within books inside. The book itself is kind of large, but as you turn the pages you find many more books, each one smaller than the next, until you reach the middle and they start getting big again. The kidpeople are fascinated with how this one fits together and love pouring over this book. I put out some blank versions to begin the projects– getting staples in the middle seam is a bit tricky. When we run out of blanks though, I don't hurry to make more but encourage them to find a way to make a book. 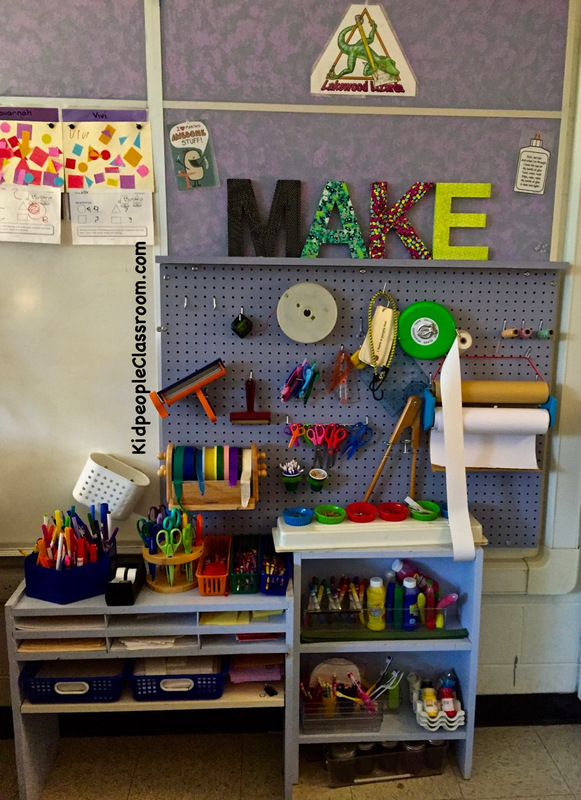 This makerspace unit leads to accordion books, lift the flap books, scrolls... you get the idea. 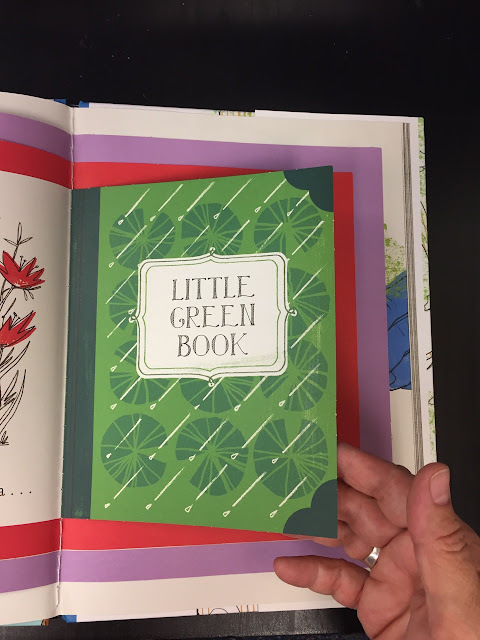 And, of course, as no book should go unfilled, they write and illustrate a story in each of their books. I tell you, there is a lot of curriculum support in our makerspace. Last but not least, we have Press Here. It is a simple concept with the idea being that if you "press" the dot, something will change with the dots on the next page. The kids love the idea of a "power button" that can make things happen. 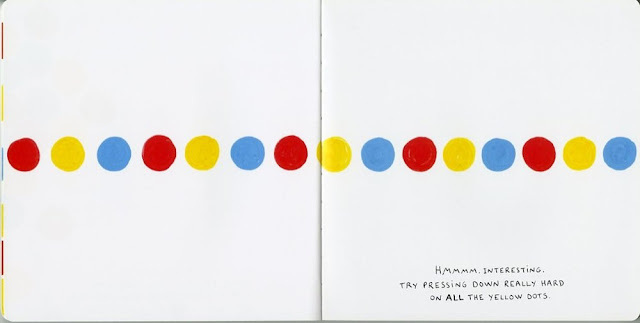 Pretty soon it is not just dots that move or change, but all sorts of imaginative action which takes place on the page after the button. One year kids made power buttons to add to their block structures... with the results almost always being some kind of topple and crash. Such great fun... loud fun... but great fun. So there you have it. If you are toying with the idea of creating a makerspace in your classroom, or expanding one, I hope these three books give you some ideas and structure for teaching into the creating process. 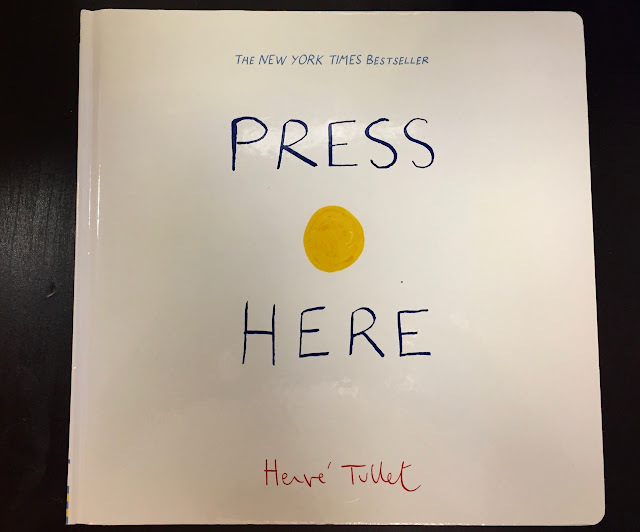 We read these books during regular read aloud time and the kids do the projects during free choice, or an occasional learning center, so everyone rotates through and tries out the new ideas. A class of little paper engineers is a wondrous sight to behold, and you'll love all the multifaceted learning which takes place. I am so happy you stopped by for Teacher Book Talk Tuesday. Be sure to click below on any other blog links to read more book reviews. You might find books for students, books for teachers, or books for pure adult fun. And bloggers if you have book reviews of your own, just grab the button below and link yours to this post, and then back again. See you later... and I do mean SEE YOU LATER! Our first of three giveaways starts in just two weeks. We'll be giving away a Flashlight Press book and ten dollar Amazon gift cards for each of the three giveaways that happen for three weeks.... you can buy some of the great books you're reading about, or anything else you want.